If you’ve looked out the window from your MetroLink train as you pass the closed Grand Station, you may have noticed the landscape is changing and some new structures are coming into view. 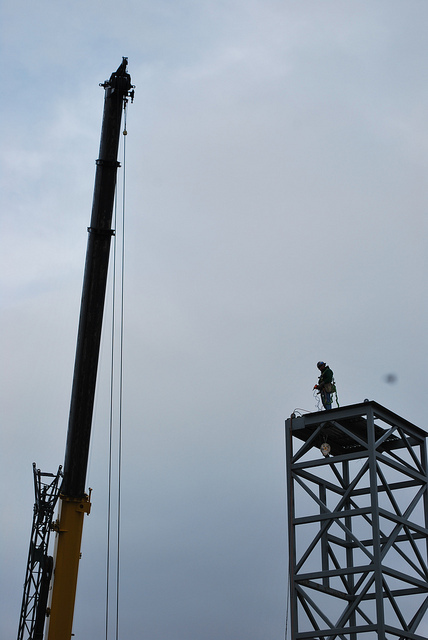 Recently, Metro contractors used a crane to lift and position the steel elevator towers on their pads. The construction activity is one of the first visible signs of the new Scott Avenue Transit Center to be built near the Grand MetroLink Station. It is also a symbol of the progress contractors for the City of St. Louis are making on the new Grand Boulevard Bridge. The bridge’s construction schedule is dependent on the winter and weather in general, but is scheduled to partially reopen in 2012. Click here to view the slideshow in another window.